It is hard to believe that the big day has arrived in Florida. There are many questions to be answered, and the weekend officially begins the final furlong of finding that Derby runner. There will be letdowns, surprises, and runners that have delivered the goods with every effort. Be sure to check your weather report on the WinningPonies site, and get your E-Z Win Forms as soon as you can get your hands on them. Time is wasting, and before you know it it will be post time! I hate to be the master of the obvious, but take it wherever you can find it. I look no further than #5 Awesome Maria (3-5). She is 5/5 in her last outings, and is 3/3 with wins over the GP oval. I am going to key her over #2 Go Unbridled (12-1) with Julien Leparoux in the irons for Alan Jerkins. Appears to be a nice closer, and the price is right for this rider. #1 Belovda (3-1), with J.J Castellano in the saddle, draws the rail and will have to bring an A+ game just to get near the 3-5 favorite today. #8 Self Control (4-1) – J.J Castellano in the driver’s seat for Chad Brown. This son of Lemon Drop Kid went a 1 1/8 with an impressive victory off the shelf. 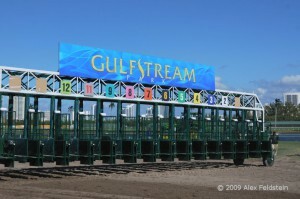 3/3 ITM at Gulfstream, and the rider is in the zone in 2012. If you get near this price, I would bet early and bet often. Be sure to checkout your E-Z Win selections to use this runner for maximum value. The race sets up nicely, and this runner seems to fit the rider well. #4 Brilliant Speed (5-2) – Has the services of John Velasquez, and has been on the shelf after finishing 3rd at the Breeders’ Cup Turf. Cuts back in distance from 1 1/8 to a flat mile. If you go back and look at the Dania Beach going this distance, you will see a very good closing effort. Very versatile runner who should give an excellent showing as the Albertrani barn fires well fresh in the past. This race begins the $300,000 Pick 4, and I am going to put together a ticket that may have you jumping for joy. #3 Zo Impressive (3-1) – Looks just like her name with Rajiv Maragh in the saddle. You just don’t know how good she is, but today will answer many questions after that incredible effort last out. #4 Captivating Lass (6-1) – Kiaran McLaughlin trainee with Johnny V in the irons. I like the maturing look of this gal, and the connections know how to bring them along ready. #7 And Why Not (4-1) – Julien Leparoux for Michael Matz, and this may be a warm up for the winner’s circle for this group. Closed strongly down the lane at CD, and the pace plays to her favor. #5 Grace Hall (2-1) – Castellano and Tony Dutrow team up, and you will not find the kindest of odds. I do respect the connections, and I think if pushed, she may get leg weary. But, this is the $300,000 P-4, and leave no stone unturned. Michael Matz is not known for giving them a race for the experience. He knows how to patiently bring along a horse (Barbaro) and should use this race as a spring board right into Louisville. The Fountain of Youth showed another dimension, and I think Matz has all of the bugs worked out. I would look for him to have this son of Dixie Union cranked up, and will be ready to train the rest of the way into the Derby. 1/1 at Gulfstream Park, and if you get anywhere near 6-5, I would consider that great value. He will be my single, and if all systems are go, they will have a tough time with his “A” game. #9 Keertana (5-2) – This runner is coming from the outside post, and the rail is to be set at 48 feet. I really don’t think Leparoux will have trouble with the post or getting the distance, but there are some other runners that can turn out your lights if you do not bring your big mojo. Thomas Proctor is the trainer, and he is magic on the weeds. #8 Hit it Rich (3-1) – Castellano has the call, and he is having a great year. I like his ability, but that last 1/16th of a mile may get tough to handle. #5 Shimmering Moment (6-1) – Joe Rocco Jr. gets the nod, and won last out under Mr. Lezcano, who is in Dubai. Looks like a looming stalker who can get the job done if the cards fall his way. #7 Senada (8-1) – Edgar Prado up for Barclay Tagg, and these guys used to do well as a tandem. Nice closer who is 2/2 at GP ITM, and 2/3 ITM for the distance. Runs well fresh, and has been working nicely in the morning. 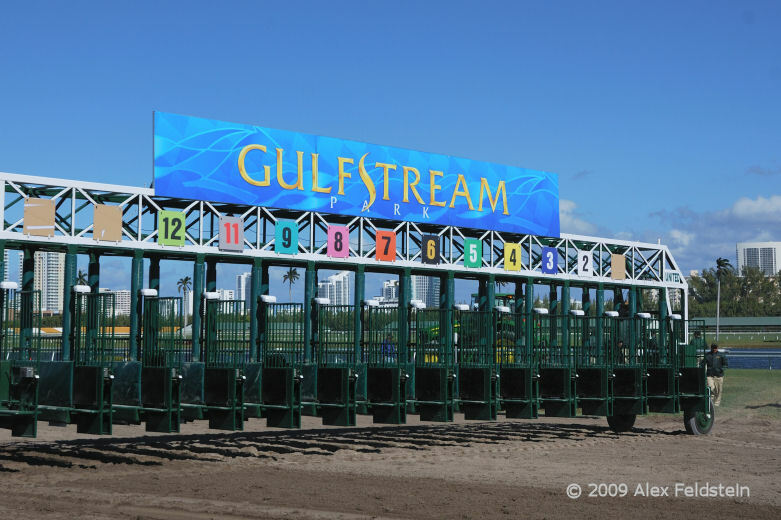 Race #13 – ALL – This race may be wide open, and the favorite draws the 12 post and jumps up in class. May the wagering gods smile upon this race if we are alive in the Pick 4. The cost of the ticket: 4 x 1 x 4 x 11 = $176.00 for a $1 ticket, and $88 for a 50-cent version. Be sure to check for any late weather changes, and get your hands on the E-Z Win Forms to prepare in advance. As always, “may your winners be many, and your photos be few.” Good luck this weekend! Always love the free picks Ed, they are so appreciated.